Last week, my friend Denis Dineen and I were interviewed by the lovely Miriam Gennari for a taping of the Arlington Weekly News at the Arlington County Independent Media studios in, naturally, Arlington, VA to appear in one of her wonderful Being Green segments. We were there chiefly to promote the International Plug-In Day event on 28–29 September of this year. The episode is schedule to premier today, Thursday, 22 August at 18:00 (6 pm), with repeats Saturday, 24 August at 10:30 (10:30 am) and Monday, 26 August at 20:30 (8:30 pm) as well as 3 overnight airings. Arlington County Independent Media can be recieved on Comcast Channel 69 and Verizon FiOS channel 38 for Arlington residents. In my interview I quoted my estimated mileage cost as 1,500 miles per month and a household electric bill on the order of $25. My regular readers may remember my excitement for and analysis of the current Dominion Virginia Power Time-of-Use (ToU) power rates two years ago. Since then, I've picked up my Nissan LEAF and driven over 34,000 miles in 21 months of ownership and have a much better handle on how much it costs to drive electric. As I announced that October, I went with the Schedule EV dual meter rate plan. Once I signed up for the ToU rate plan, I asked the electrician who installed my Clipper Creek CS-100 to split my EVSE's (Electric Vehicle Service Equipment) subpanel from the main subpanel in order to be hooked up to the second, electric-vehicle-only meter to be installed by Dominion, which would happen later. MOM's Organic Market in Herndon had just opened, replacing the vacant suite that had many years ago hosted the only Hard Times Cafe near my home—I was gutted to see this restaurant go and for the space to be empty for so many years. Had it been any other store than MOM's which would have replaced it, a boycott of the new occupant would most assuredly be in place! Now, MOM's is a very EV (Electric Vehicle) friendly business. Employees even get a $5,000 rebate towards a qualified electric car like the Nissan LEAF. Part of MOM's commitment to EVs is that at most of their stores, including Herndon, they have free EVSEs where a patron can charge his electric car. So I went over to MOM's and introducing myself and explained my situation. That's when I met extremely affable and helpful store manager JP Exon who was more than happy to have me leave CO2 Fre plugged in over night while I waited for Dominion to install the second meter. I needed the EVSE at MOM's because I drive almost 70 mi (113 km) a day, which is most of my Nissan LEAF's battery pack. Because a wall outlet could only charge my car to about 90% of the amount used in a day in the 12 hours I'd have it plugged in at home, it meant I had to use a full, Level 2 EVSE with at least 3.8kW power. Thank goodness, therefore, for MOM's! So in early December of 2011, my EVSE was disconnected, after just over one month of at-home charging, and I started to plug my car in every night at MOM's in Herndon, then walk home. In the morning, when I couldn't get a ride, I'd walk all the way back and then drive my car to work only to do it all over again the following night. This went on for weeks while Dominion dragged its feet about installing my second meter. As the year drew to a close, and Dominion still hadn't scheduled my second meter install, I started getting anxious. After a number of calls and e-mails they finally installed my second meter just before the end of the year and I could finally plug in at home again. 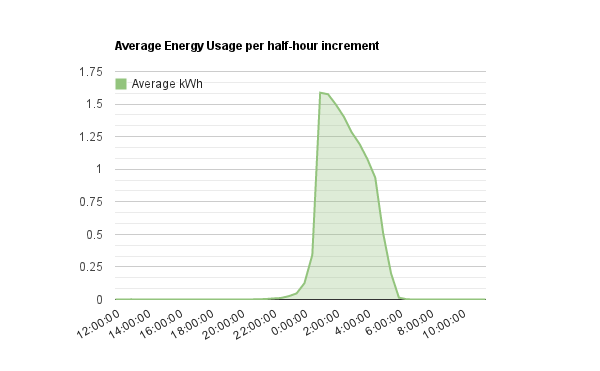 As a part of Dominion's Time-of-Use EV Rate plan experiment, I'm able to view my electric usage in 30-minute increments in terms of both net energy and peak power since the meter installation. Recall that the 2011–2012 Nissan LEAF has an inefficient 3.8kW charger that in turn feeds the battery at merely 3.3kW, meaning up to 500W of energy is wasted in the process. Since the power is measured at the plug, these numbers don't reflect the energy the battery receives, rather they reflect the energy used including powering the EVSE and the LEAF internal charger. Because the increments are in half-hour intervals, the total energy is half that used in an hour, or about 1.9kWh at most for a given interval. As you can see from the chart, my power spikes at around 01:00 (1:00 am) because that's when the Super-Off Peak rate begins. There's a small component before that when I want want to get a little extra charge to cover a severly depleated pack but for the most part I start at 01:00 (1:00 am) and finish by 06:00 (6:00 am) on weekdays, just before Peak rates begin, or 05:00 (5:00 am) on weekends, just before the regular Off-Peak begins. One interesting aspect of my ToU data is there's always a gap at 02:00 (2:00 am) when Daylight Savings begins. The data has blanks for the two periods from 02:00–02:30 (2:00 am to 2:30 am) and 02:30–03:00 (2:30 am to 3:00 am). Interestingly enough, when we gain an hour by going back to standard time, there's no corresponding double entries for those same hours. What my power utility and EVSE are doing then, I have no idea. For any reader interested in the full, massive data set of charging events, please send me a note and I'll be happy to share it. On 30 October 2012 I finally became a member of the EV Project. My good friend and absolute favorite elecrician, Sean Ryan, came out that day to add a second circut to my sub panel and install the free Blink charger from ECOTality. Obviously I'm biased but not a better electrician could I ever recommend, so thank you Sean! Now the Blink unit is a great charger, apart from perhaps a overly flimsy connector. With it, I can schedule a charge on the EVSE and leave the LEAF set to always charge when plugged in. And I can schedule the EVSE timer remotely so if I need to make a change I don't have to walk down to the car, turn it on and fiddle with the timers. The only problem is the LEAF doesn't realize it's plugged in and then sends me pedantic and eroneous text messages to tell me to do so; so bad is this that when I do forget to plug in I neglect the message because more often than not it's in error. When I get up the next morning, let's just say the shock and horror on my face would make you think I was in the scariest movie possible. Of course the disadvantage of being able to schedule a charge remotely is that the Blink EVSE is always on. In itself this isn't a problem but the unit is even on during Peak Time-of-Use rates. As you can see in Table 2, since the install I've consistently had to pay about a dollar a month to cover the cost of the EVSE's daytime power. Since this is power I'm not actually taking advantage of, it's called Vampire Power, indicating that it's power being sucked out of my wall in order to feed a hungry device. Interestingly, last week I plugged in CO2 Fre to find my Blink unit in a constant rebooting loop. I called ECOTality to let them know about the issue and since then I've been using my Clipper Creek CS-100 again, so at least the Vampire Power should be low next month. But now that I'm back on the car's timer, I need to be extra cautious to press the charge timer disable button when I want to charge at a public EVSE. On 2 November 2012, CO2 Fre celebrated her first birthday!  For that entire year, apart from a fortnight spent visiting the favourite landing spot of the TARDIS, the birthplace of the Beatles and home of Nessie—for the first time in my life I got to watch Doctor Who live: Asylum of the Daleks and Dinosaurs… On a Spaceship! Yes, this author is a huge Doctor Who fan and runs a mailing list, a facebook group and a meetup site dedicated to it. Let it not be said I'm only interested in Electric Cars and I'm well aware and have been psyched about the fiftieth anniversary special, and have been since around the twenty-fifth and Silver Nemesis! And for the record, Peter Capaldi is going to be the best Doctor ever. All that said, my heart will now and forever still be with Project Kronosphere. In any case, since my first 19,000 mi (31,000 km), I've added another 15,000 mi (24,000 km) for a total of over 34,000 mi (55,000 km). And of course 19,000 mi (31,000 km) divided by 12 months comes to about 1,500 mi (2,400 km) per month of average driving, which is where my favorite statistic derives its other value. Back in October of 2011 I estimated my annual cost to run CO2 Fre would be $486.66. As you can see above, however, it's turning out to be substantially less than that. Part of the discrepancy stems from not taking into account vacations like my UK trip or CO2 Fre's stint in the D.C. Auto Show earlier this year. Falling Electric Fuel costs have also contributed, but the main effect is that I just drive less in my EV than I did in my old ICE (Internal Combustion Engine) Vehicle. I do probably drive just as much or even more around town with my LEAF, but when you cut out the odd trip to New York or Asheville, NC, you cut out a lot of the miles I used to drive in my old car. Those kind of trips are just too impractical in my LEAF. I could, to be sure, probably make it to Rehoboth Beach, all be it with about a 5 hour layover on the way, maybe 2, but the number of 5 hours stopovers to get to New York are just not practical. Maybe with more CHAdeMO, this'd be different—and thanks to eVgo more CHAdeMO is coming to the area, and quickly—but for now, my range is about 70 mi (113 km) one-way from my home for any comfortable day trip. But even then, I'd not be charging at home so those costs wouldn't be reflected in my Dominion data. I just hope even if you can't see my segment on the Arlington Weekly News that everyone, whether you have an EV or not, try to make one of this year's International Plug-In Day events! This is your Northern Virginia PiD Captain, signing out—take care and let those electrons roll!